I received a product for review purposes but all opinions are 100% my own and may differ from yours. I will only endorse companies, products and services that I believe, based on my own experiences, are worthy of endorsement. We’ve been hit by the worst winter I’ve ever experienced since living in Knoxville (moved here in 1997). My son was out of school for 10 school days (16 days total, counting weekends) in a row due to the weather. That’s two weeks of no school. That’s more than half of those days of us being either without power, snowed in, iced in (because it all started on 2/16 with the ice storm), and dealing with frigid temperatures. My son was also sick with a stomach bug during all this. Even my son is starting to get over the snow days. Although no school is still pretty cool to him. Carri Backpacks are high quality, durable backpacks perfect for today’s busy students. What I love most about Carri backpacks, though, is that by purchasing a backpack, they give a backpack to a needy kid. That’s right… for every backpack they sell, they give one to a child in need. Awesome, I know! Having spent three years as the VP of her local Childhelp chapter, Lynette Musick recognized a need among low-income children; durable, quality backpacks that would survive more than a year through the wear and tear of daily school life. A seasoned entrepreneur, Lynette and her son, Tolson, set out to design a quality, functional backpack that provides reliability to children in need and can be shared through a simple donation process. 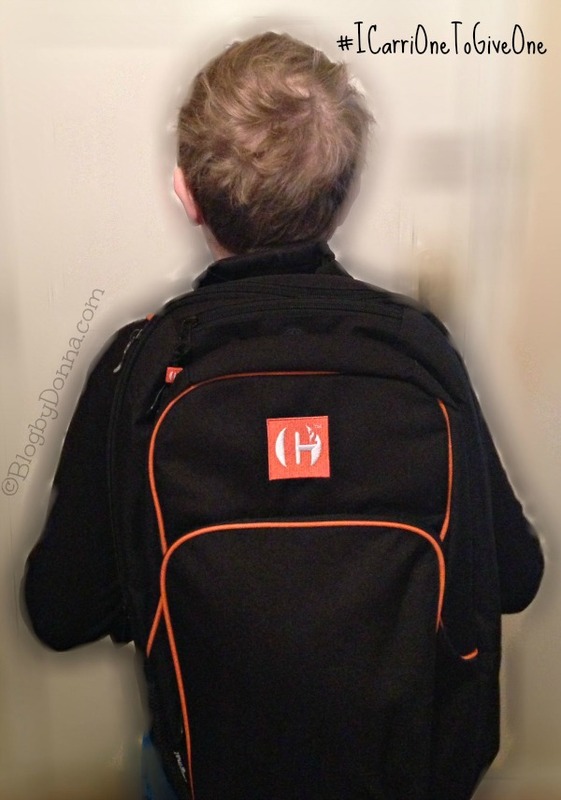 I love the Carri Backpack (and so does my son) for what they stand for and what they are doing. My son even thought it was “Cool” and told his friend at school what carrying a Carri backpack meant. If you’re a parent with a school age child, you will inevitably need to buy a backpack (or two, or three…. ), so why not help another child who needs a backpack but can’t afford one — Buy a Backpack, Give a Backpack to Charity! Buy a backpack today and know that a similar backpack will be given to a child in need in your community. Share the effort with your friends and family at www.carribackpack.com. I always want to support a good cause sales. I hope they’ll make the products go noticed. Perfect timing! My son needs a new backpack. I love the get one/give one business model. If you’re going to buy something anyway, why not help someone else while you’re at it?! I have not heard of this until this post but will definitely keep this information. As all of us parents know, we will be buying backpacks. This is great. What a great cause! I would love to be a part of this, but I don’t have a child to give a paid backpack to! My nephew is only in daycare right now, but maybe at a later date, I would be able to do this!!! This is such a great cause! Every kid should have a backpack! It’s an essential part of keeping your schooling life organized! There is no doubt that every kid deserves one! And, by buying a backpack…you give one also! Amazing!!! Love this!! Love comapnies that do this and I think way more should!! Could you imagine a world where all companies give to others?!?! Wow!! Wouldn’t this world just be an amazing place?!? Great looking backpacks. And what a great cause – thanks for sharing!